Legislative Update from Rep. Frank Iler – January 8, 2018 – Frank Iler for N.C. House – Brunswick County, N.C.
Last week at the North Carolina General Assembly was unusual for what was happening both inside and outside the legislative buildings. Although I had only one meeting to attend, it seemed to take two days on the calendar. On Wednesday the weather reports were warning of a serious snow and ice event for eastern North Carolina, so I left early to get to Raleigh ahead of the storm. Our meeting scheduled for 9:30 on Thursday was NOT cancelled, unlike some other meetings and events. The January meeting of the House Select Committee on N.C. River Quality was too important to be delayed, and all but two members got into Raleigh to attend. Senior Chair Ted Davis was correct not to cancel it, as the House and Senate need to take action on this subject at the one or two day session beginning on the 10th. Representative Davis and our committee staff have come up with a bill, which was presented and discussed at the meeting Thursday. The committee then unanimously passed it so it can be considered by the full House. It does not yet have a bill number, as it will be filed this week as our session begins. 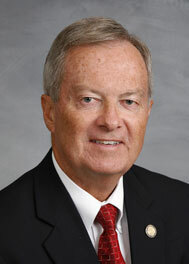 However, the bill text appears on the committee website at www.ncleg.net. Directs the Dept. of Health and Human Services to consult with the Science Advisory Board in the development of health goals for the contaminants. This is a board set up by the Secretaries of DHHS and DEQ and made up of health professionals. Directs the Dept. of Environmental Quality (DEQ) to study their permitting process and report back to us by April 1. Directs DEQ to share water quality data with neighboring states. The bill will be taken to the floor for a vote this week. We will be in session beginning Wednesday. An appropriation may be added during that process. As I have said, DEQ has a budget of $228 million this year, and no one has seriously addressed an amount that may be required to do the job, since the job apparently is not getting done for $228 million. © 2019 Frank Iler for N.C. House – Brunswick County, N.C.